Describe the ways the industry plants, grows, and harvests trees. Explain how the industry manages its forests so that the supply of trees keeps pace with the demand. Tell how the industry has incorporated the concepts of sustainable forest management (SFM). Describe two ways the papermaking industry has addressed pollution. List the trees that are the major sources of papermaking fibers. Discuss what other uses are made of the trees and of the forestland owned by the pulp and paper industry. Describe two ways of getting fibers from wood, and explain the major differences between them. Tell why some pulps are bleached, and describe the process. Visit a pulp mill. Describe how the mill converts wood to cellulose fibers. Visit a paper mill and get a sample of the paper made there. Describe the processes used for making this paper. Tell how it will be used. Visit a container plant or box plant. Describe how the plant's products are made. Visit a recycled paper collection or sorting facility. Describe the operations there. 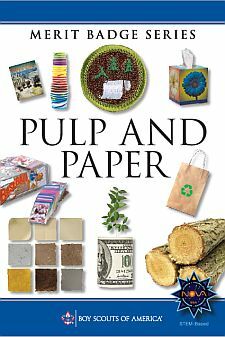 Using books, magazines, your local library, the Internet (with your parent's permission), and any other suitable research tool, find out how paper products are developed. Find out what role research and development play in the papermaking industry. Share what you learn with your counselor.